Just a glimpse on the gaming screen is enough to understand that Cool Bananas is inspired by an iconic film monster known as King Kong. The background image behind the reels shows a giant ear-pierced ape standing on a skyscraper, dressed in a Hawaii shirt and wearing sunglasses. The symbols include classic poker cards from Nine up, skyscrapers, a blonde, ice cream, etc. 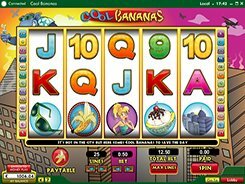 The slot offers two bet options that may be adjusted between spins: a coin size ($0.01 to $10) and the number of active lines. By customizing these options, you may set a total bet anywhere between one cent and $250. The Ape acts as a substitute for all symbols except for scatter, and pays out the grand prize of 5000 coins ($50,000) for five of a kind. Among the most rewarding combos are also five Blondes ($10,000) and five Skyscrapers ($2500). The Banana symbol is a scatter that awards a free spin feature if 3+ scatters occur in any place on the reels. 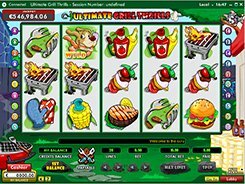 You get 8 retriggerable free spins with all prizes doubled during the feature. PLAY FOR REAL MONEY!